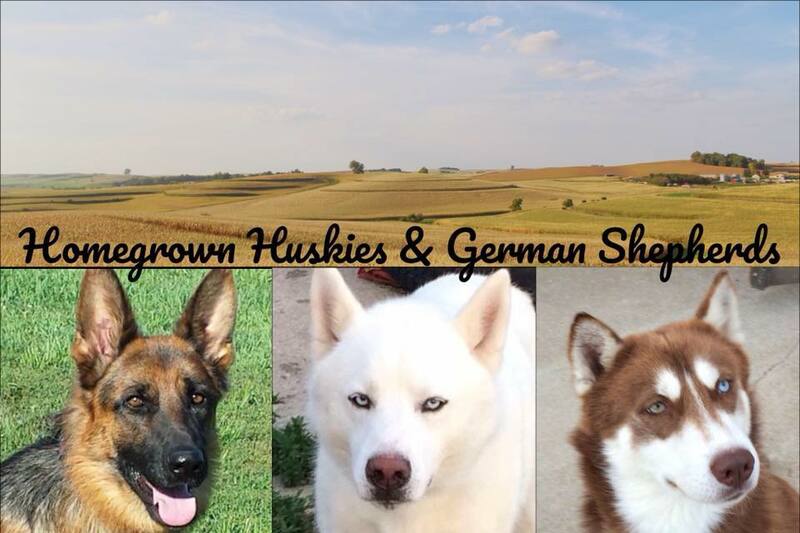 Homegrown Huskies & German Shepherds – A family owned operation that prepares happy healthy puppies for you! Ready to be matched with your perfect pet? My love of Siberian Huskies started with my daughter's first dog. For her 7th birthday she received a black and white Siberian Husky she named Midnight. She watched Balto over and over and I blame that for this love of huskies. Now, as parents we all know when our kids get a dog we end up doing the work until they can do it all. For the first several nights Midnight slept beside my bed because he didn't like it outside. I was always a firm believer that dogs were outside animals. My parents never allowed them in the house. For 6 years that dog and my daughter did everything together. When I couldn't find her I just had to find him and she'd be not far off. Midnight being a husky had the typical need to run. We had a 5 acre acreage, but that was not enough. He ran with the neighbors cattle and the other neighbor's horses. It meant some lovely discussions with our neighbors about keeping him home. This was before the invisible fence and other solutions that are now available. One day Midnight disappeared, which happened once in a while. Normally he'd be back by morning, but this time he never came back. After that we never thought of having a husky again because they didn't stay close to the house and caused trouble. Fast forward 15 years and adding another child, I just sold my restaurant and wanted to start something new that my whole family could be involved in. My kids were mostly moved out and busy with their own lives. My youngest was at the age where he really wanted a dog. He was old enough to care for one so I decided to start researching dog breeding. We had local breeders of other breeds that seemed to love the work. I visited with them as well as my kids to see what they thought of the idea. It took several months, but we decided to get a husky. Finding the right one took several months. Thanks to my daughter for scouring the internet for the perfect stock for this new journey. I flew in Casper from North Carolina as a puppy. I loved him immediately. Shortly after I added Sabrina and Sadie to the pack. They were our little family.It surprised me how hard it was to say goodbye to my babies when they went to their new homes. To this day it still is hard for me to not shed a few tears when the last pup leaves. As it stands now I do most of the loving of dogs with my grandkids. My daughter Ashley handles the internet stuff and helps out when she can. It is a family affair and we couldn't be more proud of the dogs we raised and the puppies we offer to new families.